New stompboxes are the company’s first-ever reverb and chorus offerings. NAMM 2019: Dwarfcraft Devices has unveiled two new pedals, the Treeverb and the Body Mod, which mark the company’s first forays into both the reverb and chorus markets. The Treeverb reverb pedal boasts knobs for Length, Tone, Character and Mix, as well as a switch that toggles between Hall (“a traditional, long reverb”), Pitch (allows for octave up and octave down) and Modulated (“made for all kinds of atmospheric, woozy and sci-fi sounds”). 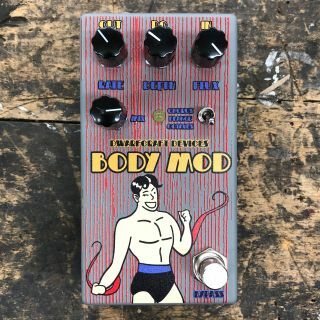 The Body Mod features three onboard modes: Chorus, Flange and Octave. There are controls for Rate, Depth and Mix, as well as a Flux knob which, in Chorus mode, adds an upper octave and other effects. In Flange mode, meanwhile, the Flux acts as a resonance dial, while in Octave mode it works as a filter on the sub octave and upper octave signals. Both pedals boast a full wet/dry blend, top mounted jacks, 9v center negative power supply and true bypass soft switching. Each pedal will retail for $199. For more information, head over to Dwarfcraft.